Well, anyway, her question inspired me to create this post for all of you. Surely, it is not only she who struggles with asking for salary increases. I have to do that once in a while. In fact here’s my story of how I increased my salary last year. The problem is many are apprehensive to do it for fear they’re going to be kicked out from work! The last thing you want to do is to give your boss a lot of reasons not to increase your salary. Become one of the most valuable employees. Besides, if he means business, you do so too. Don’t complain when you need to log extra hours or have to bring some files back at home or when work steals your weekends. Do more than what is required of you and make sure your efforts don’t go in vain. I can easily tell a good sales rep from a bad one by his demeanor and manner of speech. If he seems to falter or not confident at all with what he’s doing, I immediately decide not to get anything from him. People who lack confidence are not trustworthy. If they can’t trust themselves, how can I ever trust them, right? It’s the same thing at work. If you want to persuade your boss you deserve the raise, then better make sure it’s what you really want and you’re full of confidence about it. Otherwise, it’s going to be so easy for your boss to say no, and you have no other choice but to accept it. If you’re working under someone else’s supervision, then you’ll definitely be evaluated. Don’t be scared about it. In fact, embrace it. If you get great scores or feedback, then you have the tools you need to prove you deserve the raise. On the other hand, if the grade is fair, you can always ask for tips and some coaching from your supervisor or manager, so you’ll be able to raise your figures during the next round of evaluation. Please don’t ever tell your boss you want a raise because your friend just received his. In the first place, it’s an implied rule you should never discuss your salary with the others in the workplace. Managers and business owners have their own reasons why you didn’t get one while others did. It may sound unfair, but that’s how things really work. Rather than whine about it, approach your manager and ask what you can do to deserve a raise. If you need a salary raise, don’t immediately go to the higher-ups, especially if your organization recognizes hierarchy or chain of command. Instead, appeal to your direct supervisor. Let him know about it, and he’ll be the one to raise the issue to the management. This is also good too since your supervisor can vouch for you. After all, he’s the one who sees all your efforts. When you need additional wages or a boost in your income, it’s time to pay a visit to your contract. What does it say? Does it inform you about how salaries are being computed? Your contract may tell you how often you should receive a salary increase and how it shall be computed. You can use this as additional proof. In truth, there’s no definite rule on how to request for a salary increase, unless stated in your office handbook or work code. The easiest is to simply express it. Your boss may or may not be open to it, but the most important thing is you get the word out. The ball isn’t in your court anymore. There will be times when you really cannot expect a salary increase. For example, your business may be suffering from the effects of recession. It’s impractical and rude to demand one at a time when the company needs you to be very understanding. Also, remember when you do good, you’ll definitely be rewarded. If your boss sees how much effort you put on your job even if they cannot guarantee you with any increase, he’ll definitely be more open-minded to it and may even hand you what you need as soon as the economy starts picking up. 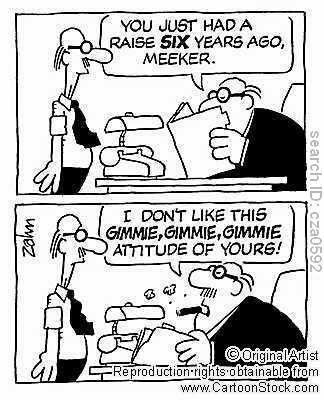 Now the other important aspect is to know what not to say when asking for a raise. I need more money to feed my family – Fine, get another job, this is what we can pay. Don’t beg for the raise, maintain dignity. Alan makes more money than I do – So you talk about confidential matters in office? I see! You may get in to the black book, sir! Because of recent layoffs, my work load increased – Oh really? Do you want your entire work load to be taken off? It has been a year since I had my raise – Only one year! Thank god that you didn’t have a pay cut. I got a new certificate/degree – A new degree doesn’t mean you are doing more work. I’ll quit if I don’t get a raise – Unless you’re an exceptional talent and people of aware of it, You will land up with no job in the end. I was once impressed by a girl who came up to me at the end of negotiation and asked me what she could do in next one year to have her salary increased by at least 10%. A year later, I convinced my line manager to sign on her 8% increment letter, no doubt she is the best employee who reports to me. It’s normal for any employee to demand a higher salary. It is even your right. But ensure you do it properly and at the right time. Readers, if you are managers or employee who dealt employee salary in the past, would you like to share your experience, good or bad, on negotiation table? You got it right. If you work hard the raise will come. As long as the money is there at the company they understand to retain good employees it comes down to compensation. This is definitely a touchy subject. It may be easier to get this done in a smaller company when the decision makers are close by. If you are in a large corporation your supervisor may not be able to do anything due to all of the red tape. It’s definitely not an easy thing to do, but I remember the first time I did it. It was sort of an awkward conversation talking about money with my boss but in the end I’m so glad I did it! If you work hard and go above and beyond duty, you should keep track of that, to have tangible info to reports to your boss. Extra hours (the ones you did working on a project, not because you procrastinated too much during the day), new clients, money brought in… And never stop asking if you think you deserve it. I got three raises for a total 35% of starting income in less than 12 months. I like that ask for it but make sure you are doing something that merits you getting it. Like the last example: What can I do to get a 10% increase next year?….This shows you are willing to work for it and don’t have these I just want more money attitudes. It’s not always cut and dry. Some people have such a sense of entitlement that they think just because they do one thing well, or have a period of high performance, they should have the world handed to them. Never mind the fact that what they did prior was sub-par, or if the performance following the increase also was less than desirable. People need to understand that CONSISTENCY is the key to being a valued employee and team member. The other thing is that one person’s experience is just that–an isolated experience. Sure, it’s great that someone was able to negotiate a series of raises in a short amount of time, or another person was able to prove that they were worth a certain amount to the company and therefore got a substantial raise, but every single situation is different. It’s important to be able to make that distinction, and not to get your hopes up just because you heard someone succeed. You as the worker, the size/industry/profitability of the company, the people involved in the decision-making process, all come together to make a unique situation, and it can’t be stressed enough that what worked for one will not always work for anyone else. If you’ve worked hard, acquired a lot of skills, and become indispensable to the company, then honestly, the way to ask for a payraise is to interview somewhere else and get a job offer. You can ask, beg, and plead all you want, but some companies are just unwilling to give you your due. Now, the moment your company’s competitor wants you, the rules of the game change entirely. All of a sudden they have new funds to pay you. In some cases, they’ll even add on a bonus, stock options, RSU’s, you name it. Things you would have otherwise never have gotten if you didn’t threaten to leave. Those are good suggestions. You should never shortchange yourself at work and at the same time, you should not feel entitled to a raise. I’ve generally had yearly reviews so I’ve never felt the need to ask for more money mid-cycle.